Coastal Empire Beekeepers Association | Serving the Coastal Area for over 30 years. Our mission is to promote and support responsible beekeeping practices; that benefit honeybees, beekeepers, our citizens and our environment throughout the Coastal Empire Low Country; where we live and call home. CEBA provides a social time from 6:00 – 6:30 PM for members and visitors to gather information and to talk about beekeeping among themselves. We also serve a light food trays and coffee during this time. We will continue with our educational speakers in 2017 from 06:45 to 08:00 PM. Our focus in 2017 will be to grow our apiary & public programs, along with watching our Pollination Garden evolve as Master Gardeners help design our apiary’s new look for 2017. CEBA committees are working to build our Saturday Programs into a Demo Educational / Apiary morning of activity. We will send out updates as this evolves. 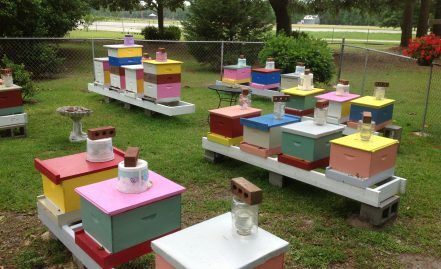 URBAN BEEKEEPING IS NOW LEGAL inside the city limits of Savannah! In October of 2015, the City Counsel voted to adopt the same ordinance used by the Chatham County Animal Control. The interest in beekeeping is spiking again for CEBA, especially with our programs growing at Oatland Island. We invite guest to come and check us out, as we would love to share our experiences in beekeeping with you. Membership is open to the public, anyone may join our organization. CEBA is also transitioning from www.cebeekeeping.com to our new Membership Site: Wild Apricot. We are maintaining links to keep information available at this time.